The Instituto Nacional de Estadística (INE) released Venezuela’s latest official poverty figures on May 23th. To calculate this indicator the INE uses what is referred to as the “poverty line” method for its measurements. This method compares household income to a poverty threshold estimated as the average purchasing cost of a preestablished set of basic consumer goods (la cesta básica). However, in Venezuela’s a polarized political context, even basic policy measures like this are subject to varying interpretations. From a pro-government standpoint, the latest numbers supply evidence that Venezuela is again on the path of poverty reduction. 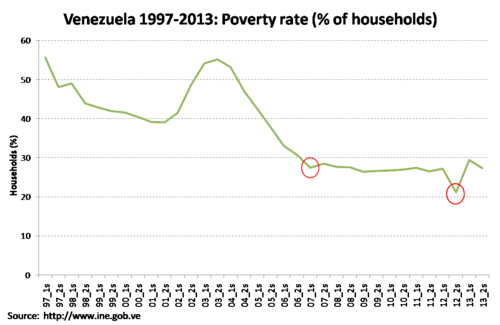 Poverty rates decreased from 29.4% to 27.3%, if you compare the first and second semesters of 2013. From the opposition’s perspective, in contrast, the numbers show that Venezuela is losing the fight against poverty. The poverty rate has increased by more than 6% if you compare the second semester of 2013 to the second semester of 2012 when the poverty rate was 21.2%. Both narratives are based on the same data and are factually correct. What both lack though, is a longer temporal perspective. Measures of poverty that are based on income such as the poverty line method, tend to show considerable variation. All of the variables that influence income have an impact on the measure, for example growth of the economy, levels of unemployment and inflation. It is therefore predictable that in a year of high inflation, such as 2013, the measure will show a year-on-year increase in poverty because of the loss of purchasing power. But there are other important aspects to consider. For example, if we look at the series between the years 1997 and 2013, we notice that during most of that period poverty is usually lower in the second semesters compared to the first semesters of each year. This is due to the fact that in Venezuela the payment of end-of-the-year bonuses to workers in November and December, and the rise in consumption during the Christmas holidays generate seasonal growth of the economy during the second semester. This reduces poverty as measured by the poverty-line method and explains why there was a slight reduction of poverty from the first to second semesters of 2013. Yet another aspect is worth considering. In the graphic provided by the INE, I have marked with red circles the last two presidential elections in which the late Hugo Chávez participated: 2006 and 2012. In both years, a steep rise in public spending resulted in a notable decrease in poverty. This is most apparent in 2012. If we look at the overall trend lines beyond these seasonal and electoral blips we can see steady progress in poverty reduction through the first semester of 2009 and stagnation since. As I have explained elsewhere, poverty measures based on income, used during a period of oil bonanza, have resulted in an overestimation of the government’s accomplishments on poverty reduction, especially their sustainability. Because the structural factors that cause poverty and inequality, such as poor education and health services, have remained precarious, Venezuela still faces important problems related to social exclusion. Dr. Lissette González is a stratification researcher at the Instituto de Investigaciones Económicas y Sociales of the Universidad Católica Andrés Bello. Read the original post in Spanish here. Translation by Hugo Pérez Hernáiz and Timothy Gill.